In fact, the Authors review over 560 published works of non-fiction (more than a dozen are revealed here for the first time) and a further nine unpublished non-fiction pieces. Full details of these unpublished pieces are revealed for the first time. Covering all King's published and known unpublished works, Stephen King: The Non-Fiction reveals for the first time dozens of pieces of non-fiction and their appearances that were previously unknown to King researchers. If you've ever wanted to know more about King's amazing and often controversial non-fiction, this is the reference work you must have. 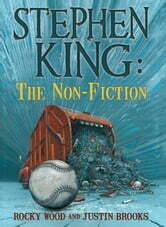 Stephen King: The Non-Fiction is going to be a must-have for every Stephen King collector!